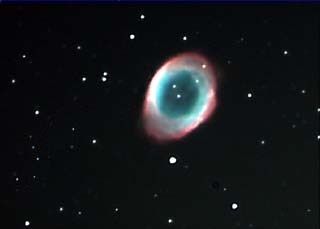 M57, the Ring Nebula, imaged by the Hubble Space Telescope. The Ring Nebula. Image courtesy Richard Crisp. 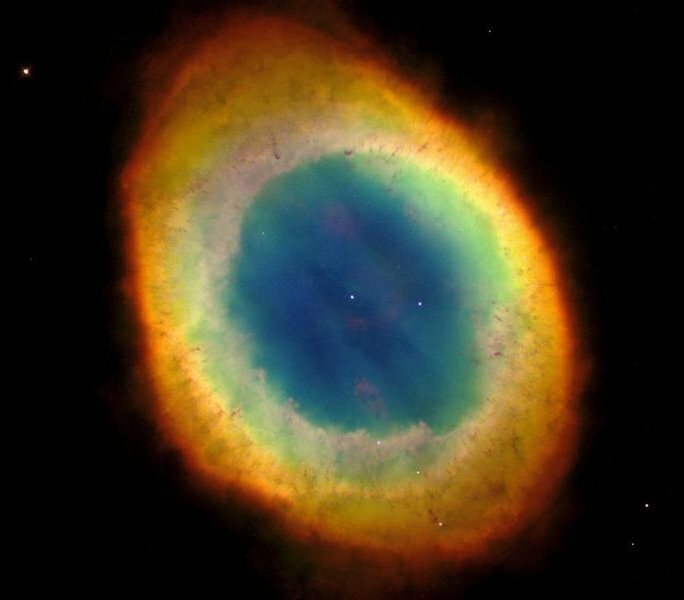 The Ring Nebula (M57, NGC 6720) is one of the best known planetary nebulae and the second to be discovered, by the French astronomer Antoine Darquier (1718-1802) in 1779 (15 years after the first one, the Dumbbell Nebula). It is located in the constellation Lyra. The central star, which has a visual magnitude of 14.7 and a surface temperature of over 100,000 K, was discovered by the German astronomer F. von Hahn in 1800. Although appearing as a flattened ring, M57 is actually toroidal or possibly even cylindrical in shape; we simply happen to be looking more or less down one of its poles. Viewed along its equatorial plane, the Ring would more closely resemble a filled-in planetary, such as the Dumbbell. Sensitive observations have also shown that the toroid or cylinder has lobe-shaped extensions in polar directions, and also a halo of material extending to over 3.5' (2.4 light-years) – remnants of the central star's earlier stellar winds before the nebula itself was ejected. 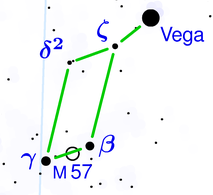 M57 is easy to find, between Beta and Gamma Lyrae, at about one-third the distance from Beta to Gamma. It can be seen with binoculars as an almost stellar object. In small amateur telescopes, the ring becomes apparent at about 100 magnification. If ever color is notable, the Ring appears greenish because most of its light is emitted in few green spectral lines. Even in small scopes, a slight ellipticity is noticeable, with a major axis at a position angle of about 60°. Under good seeing conditions, large instruments may reveal the central star, together with several very faint stars that lie in the foreground or background of the nebula's extension.